Kitty and Russell here and it's Stretch Tuesday! We have had a couple of days of rain which renews the earth. Unfortunately it is fall so the new plants that are popping up as well as the plants that are in bloom will soon perish as all of the hills have snow and we will soon feel fall’s frozen wonderland. But today, we thought that the only pressed iridescent flower pots in stretch or carnival glass would be appropriate to honor the last flowers of the season. The Concentric Rings Flower Pots are another pattern which could be considered both in the stretch and carnival glass categories. The vases come in two sizes; smaller vases are @ 6 1/2″ tall whereas the larger vases are @7 1/2″ tall. 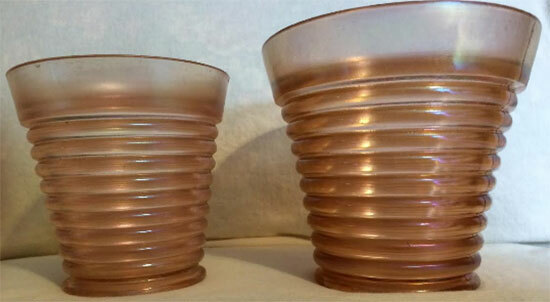 The saucers also come in two sizes; small one is 4 1/2″ and the larger one is 5 1/2″. The sizes do vary a little as some vases are more vertical than others. All of the vases have a circular drain hole in the base just like all usable garden flower pots! The Flower Pots and Saucers have the Fenton mold numbers of #1554 and #1555. The Fenton Art Glass Company in 1927 advertised their “Campaign Assortment” which showed a #1555 Flower Pot and Base (saucer) in pink. Under the catalog is the caption: “Assortment of items in colors of aquamarine, rose and green.” This catalog page is shown in William Heacock’s Book Fenton Glass: The First Twenty-Five Years page 93. 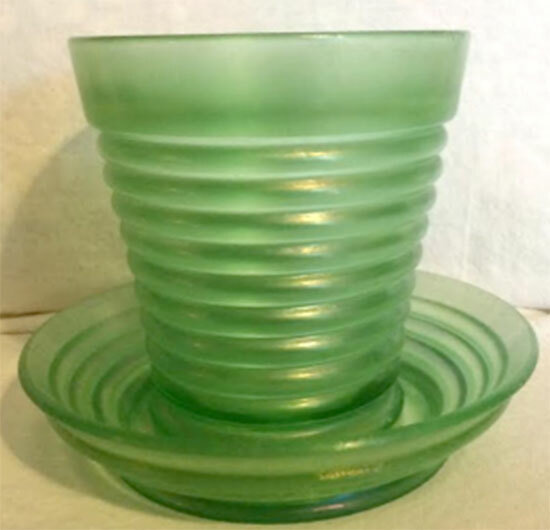 Fenton used the molds for a number of different types of glass through out the years. 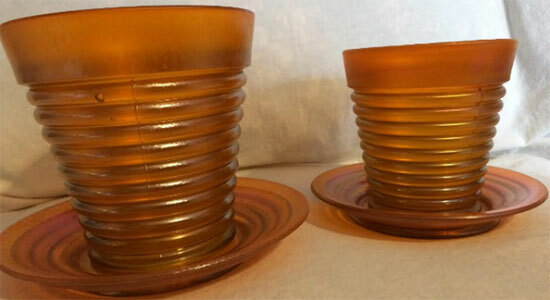 There are a number of pieces that have the Concentric Rings pattern in stretch such as bowls in a variety of shapes, vases stretched out of vase mold, as well as creamer and sugars sets. None of these pieces have a drainage hole in the base. 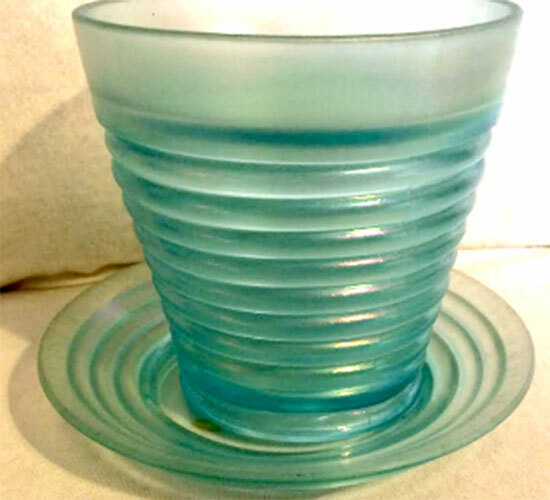 Please note that Dave Shelter and John Madeley’s book American Iridescent Stretch Glass uses the pattern name as ‘ringed’ and the tall vases as ‘ring optic’. Marion Hartung in her tenth Book on page 49 shows the Flower Pot. 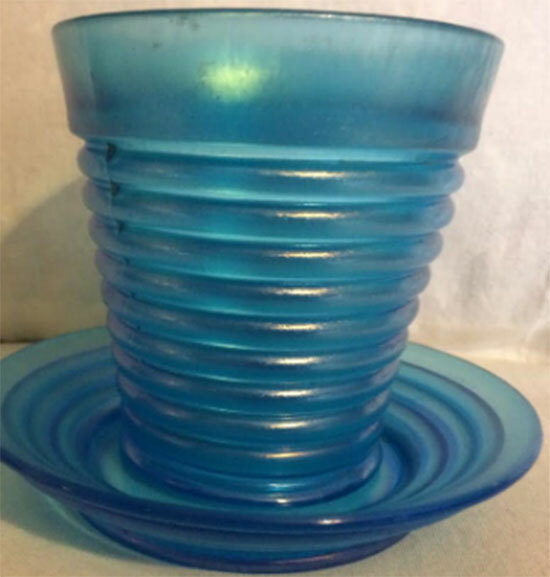 The Concentric Rings Flower Pots have been found in the normal Fenton color range of Aquamarine (light turquoise), Celeste Blue, Florentine Green, Tangerine, and Velva Rose both a light pink and the pink with a charcoal dark finish. 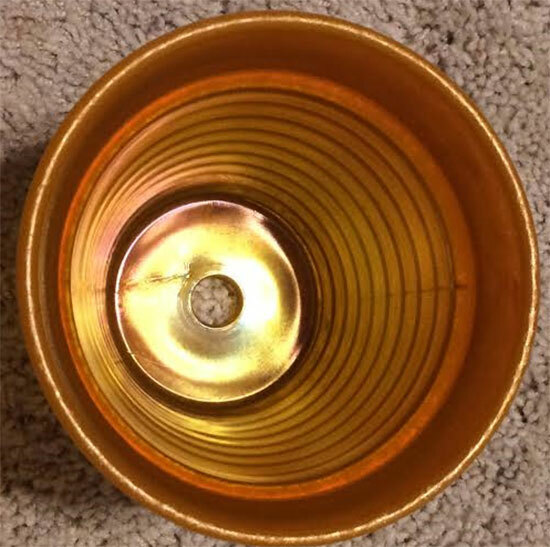 In the late 1970’s a beautiful red Concentric Rings Flower Pot was found in the San Francisco Bay Area, but only the owner could see the iridescence! We have not seen a Pearl, Topaz, nor an iridescent red Concentric Rings Flower Pots. 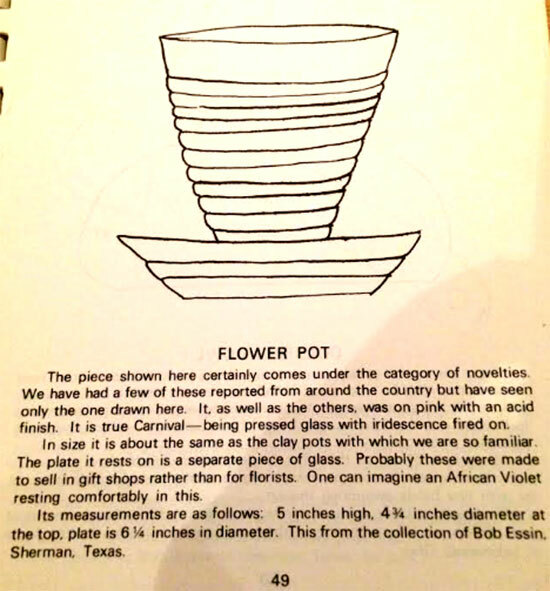 All of our flower pots have come from the Northern California area in the 1960’s to 1990’s. Maybe a big shipment was sent to the Bay Area florists because we garden all year? The celeste blue flower pots are the hardest to find maybe because celeste blue is such a popular color. Am sure that with the internet the Concentric Rings Flower Pots can be found all over the United States as well as the world!